FOR SEPTEMBER – NOVEMBER 2019 Invitation /Admission STARTED !! We try to make applying to study in ukraine as flexible and straightforward as possible. 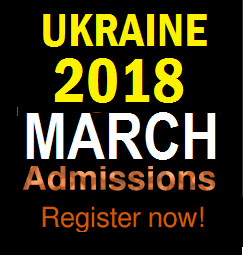 We Are proudly to Announce that UKRAINE UNIVERSITIES AND MINISTRY OF EDUCATION , Has concluded to start up MARCH INTAKE ON yearly BASIS FOR THOSE (STUDENTS) WHO DID NOT MEET UP FOR APRIL -NOVEMBER ADMISSION , CAN NOW APPLY WITH EASY FOR NEW MARCH INTAKE , The 2019 admission cycle is currently open /IN PROGRESS and will close Soon. We do not consider late applications. INVITATION FEES MUST BE PAID BEFORE WE SEND YOU INVITATION LETTER . ADMISSION FEES FROM 425$ TO 675$ DEPENDING ON THE PROGRAM YOU WISH TO STUDY IN UKRAINE WHILE COURIER CHARGES IS 100$ AND BANK CHARGES IS 25$ TO 30$ NO ANY HIDDEN CHARGES LIKE OTHER AGENTS APPLY NOW ADMISSION WITH LIMITED SEAT . PPL, CPL and CPL with multiengine aircraft ,computer Science, IT Courses, BDS(Dentistry),Nursing, Microbiology, Computer/ Aviation/ Aeronautical/ Civil/ Electrical/ Architecture Engineering, Business Administration BBA, MBA, Marketing, Accounting, International Relations, Law & many more. Bachelor 6 years OR 5 Years. Nigeria, Ghana, Zambia, Namabia, South-Africa, Zimbabwe, Cameroon,Kenya,indian,Angola,Egypt,lesotho, . All of UKRAINIAN Universities programs admit new students in the winter * MARCH . A limited number of programs offer additional intakes in the winter and/or spring/summer terms. We encourage you to apply as soon as possible after applications open in order to improve your chances for admission. OR fax +380577204730 for confirmation if the mail has been delivered. ADMISSION FEES /INVITATION FOR LANGUAGE.